Northern Utah lies within United States Department of Agriculture (USDA) Hardiness Zones 3 to 7. Most of the state experiences a semi-arid to an arid climate with warm summers and mild winters. Utah’s mountainous areas offer cooler weather and a lot of snow. If you live in Northern Utah, select shrubs according to intended use, general culture and bloom time. Various shrubs perform well in Northern Utah landscapes. The red elderberry (Sambucus racemosa), also called the scarlet elder, belongs to the honeysuckle family (Caprifoliaceae) and quickly reaches between 10 and 20 feet in height. This perennial shrub features spikes of tiny, white flowers in May and June, followed by red berry clusters that attract birds. These elderberries also work well in some wine recipes. The unripened fruit, flowers, leaves and stems all contain toxic alkaloids that can cause gastrointestinal distress. This shrub naturally occurs in rocky woods and moist ravines across Utah. The red elderberry also works well in shaded shrub borders and wildlife gardens. The cliff rose (Purshia stansburiana), sometimes called the Quininebush, belongs in the rose family (Rosaceae) and thrives in Utah’s dry mesas and limestone canyons. This broadleaf evergreen shrub grows from 4 to 10 feet in height. It features red, peeling bark and green leaves with fuzzy, white undersides. Livestock and deer like to feed on the foliage. The cliff rose bears fragrant, white flowers from April through July, followed by feathery, white fruit. This perennial plant prefers sunny positions. The cliff rose makes an excellent shrub border or erosion control plant. The bush rockspirea (Holodiscus dumosus), also called the cream bush, bears red twigs and aromatic, deep green leaves. This spreading shrub features flower panicles consisting of tiny, white to pale pink flowers that bloom throughout the summer. This rose family member (Rosaceae) reaches up to 7 feet in height and likes rocky, dry soils that receive partial shade. This shrub also grows well in volcanic ash soils and pumice. Utah gardeners often plant the bush rockspirea on dry hillsides and cliffs. The teddy bear cholla (Cylindropuntia imbricate) goes by many other names, including tree cholla, walkingstick cholla and cane cactus. This Cactaceae family member has sharp spines and an upright, shrubby form that reaches up to 8 feet in height. Flashy flowers bloom in May and June, featuring pink, red or purple blossoms. These flowers give way to showy berries that emerge green, turn pink and then ripen to yellow. This perennial shrub prefers dry, gravelly or sandy soils in partly shady to fully sunny locations. 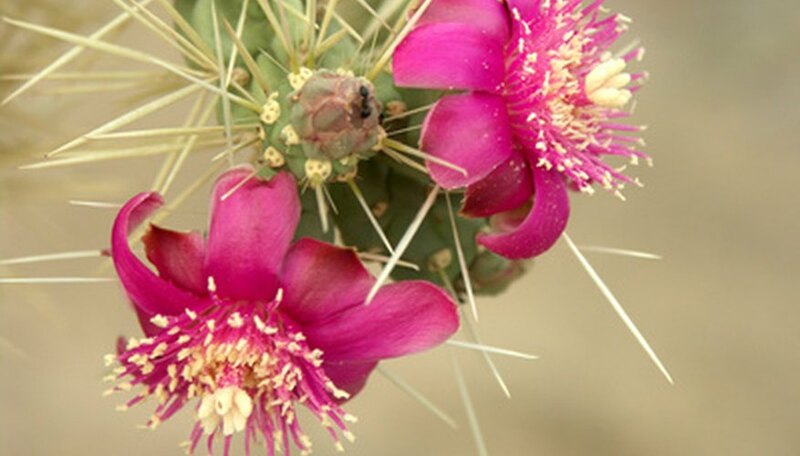 Utah gardeners often use the teddy bear cholla in desert gardens and bird gardens. Greenleaf manzanita shrubs (Arctostaphylos patula) belong to the heath family (Ericaceae) and naturally occur in Utah’s open forest areas. This perennial shrub reaches 6 feet in height and features green leaves and reddish-brown inner bark that shows as the outer bark sloughs off. Pink flower clusters bloom from April through June, followed by black, red or brown manzanita berries sometimes used to make beverages. This fire-resistant bush prefers slightly acidic soils in sunny positions. The greenleaf manzanita shrub has an extensive taproot system that makes it an excellent choice for erosion control.